Huffer is cynical, hard-boiled, and pessimistic. "He looks through the world through sludge-colored windshields." Will complain it can't be built, then builds it anyway. Not too sociable, but absolutely reliable. Arm sensors can test materials for strength, heat resistance, elasticity, etc. Extremely strong. Superior mathematical and geometrical abilities. Often unhappy and homesick for Cybertron. If you thought the scale on Cliffjumper was bad, Huffer is a tractor-trailer, in a very fetching shade of orange. Due to the plastic, ridged wheels, Huffer doesn't roll particularly well on flat surfaces, but is more at home on grass or -- I suspect was the case for a lot of them -- being ground into the mud and either lost or sluiced down by parents and inadvertently left to rust. There are a few flakes on the wheels of mine, but I can't remember where I got the toy (possibly a car boot sale) and it's still in reasonably good condition. As part of the transformation, you can rock the cab section forwards just like the real thing, and the windshield and horns on the cab are formed from an interior insert of black plastic, meaning the only paint apps are chrome for the pipes, grille and (in robot mode) face. It's a solid design in this mode. 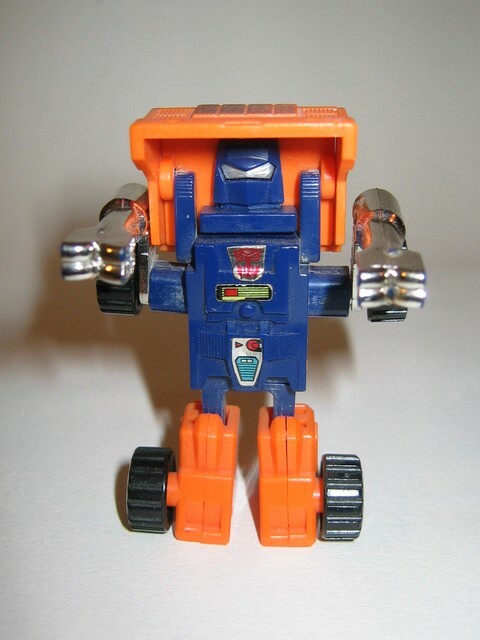 Another one of the minibots that got redesigned for the cartoon in order to make him more human for kids, personally I think Huffer is a lot more interesting doing the pissed-off zombie shuffle that results from his toy transformation. You can drop the arms so that he looks like a kill-the-humans retro b-movie star, but posing him ready to lunge for someone's throat is just plain fun. What's that you say? He's a good guy? Spoilsports. Transforming is simply a case of rocking the cab forward, extending the arms and rotating them 180 degrees, and pulling the feet down. The result is a surprisingly proportional robot, with a simple but effective high-contrast colour scheme and plenty of character. The legs work on a friction principle, but are still tight on the one I've got. Something to watch out for, though. Transformation: 3 - Definitely appropriate for the original target age range. Durability: 6 - The arms and cab joints are the potential weak spots. 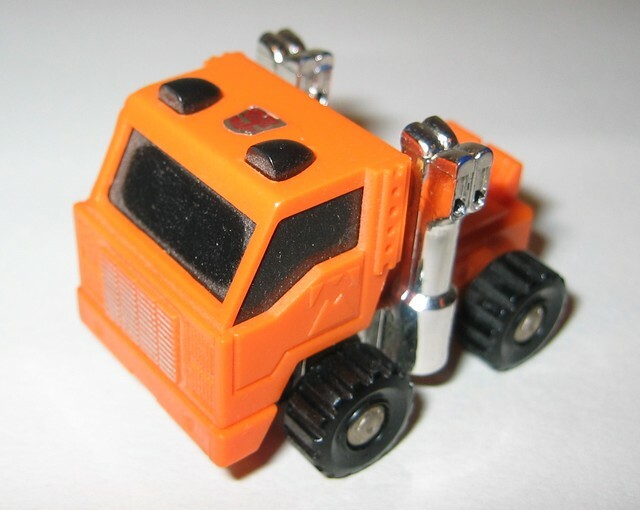 Fun: 7 - Most minibots are quite charming, and Huffer is no exception. Overall: 7.5 - I really like the lil' guy. He's the Boston Strangler of nostalgia.